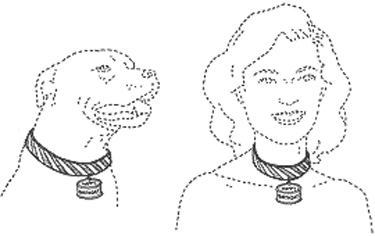 The process of dogs resembling their owners can now be accelerated if you can get your hands (or paws, if you happen to be a dog reading this) on Patent# US D504984, also known as the Matching Collar for Dog and Owner. The inventor boasts that the collar’s design will enhance the necks of both beauty and her lucky beast. Now the next black-tie affair will have the perfect accoutrements, perhaps coupled with the diamond-studded leash and canine topcoat and tails that would make Fred Astaire proud and may well be next on the inventor’s to-do list. The matching collar for dog and owner is quite versatile and can also be enjoyed casually as well. Anytime a walk in the park is called for, just put on your collars and go for a romp. Roll in the grass with your pet and run after any other poorly dressed canines that might be in the area, completing bonding beyond all reason. People may stare but what do you care? Consider buying a few of these to match different ensembles and seasons and even special holidays (like green for St. Pat’s and orange for Halloween). Here are a few other inventors’ thoughts on gifts for the well dressed pet in your life. Consider Lady Bee’s two witty pieces, “15 Great Holiday Pet Gift Baskets For Dogs, Cats, Horses, Birds & Their Owners and “The Well-Dressed Dog At A Wedding: Trend-Setting Elegance For Dog Grooms”.